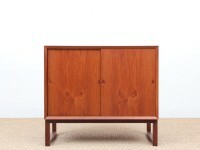 Poul Cadovius was born in Copenhagen in 1911 and was originally trained as a saddler and upholsterer. 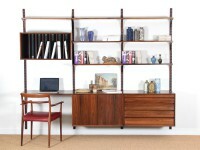 He was a successful designer who had a great influence on the furniture industry and design. 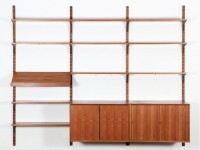 In 1948, Cadovius designed the shelving system ROYAL SYSTEM®, which through the 50s, 60s and 70s perhaps was the greatest furniture success the Danish furniture industry had ever had. 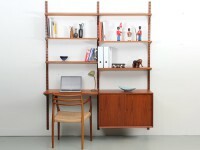 Poul Cadovius is one of the most versatile and successful personalities in Danish furniture industry’s history. 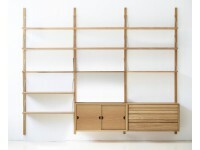 “Architect, designer, self-taught inventor, manufacturer, innovator, the furniture industry’s ‘enfant terrible’ - the titles are many”, as the author Henriette Houth writes in her book ”Kassebogen”. 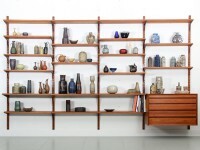 Poul Cadovius was an ambitious and constantly seeking person. 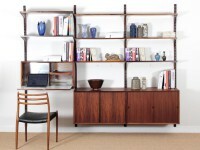 When he didn’t design or produce furniture, he was driving racing cars or building luxury yachts at his own Saghitta shipyard in Svendborg. 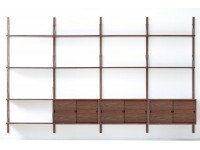 And there are many stories: When a sailboat customer claimed bad sailing-performance on a Saghitta 35, Poul took the boat and sailed ”around Zealand” - and won. 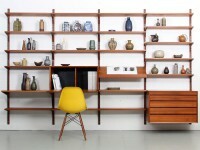 Poul Cadovius managed to take out over 400 patents -the last as a 90-year-old. 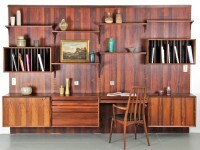 Both his life and designs testify to a genuine figure that went his own way to the delight of us all. 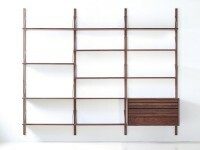 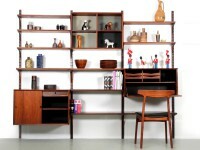 Mid modern scandinavian shelving system in walnut, model Royal System by Poul Cadovius, new edition. 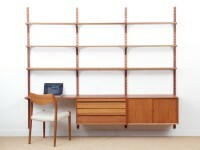 Mid modern scandinavian shelving system in oak, model Royal System by Poul Cadovius, new edition. 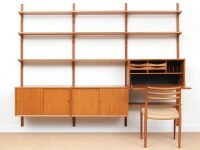 Mid century modern scandinavian wall system Cado in teak.